If you’re in search of a holiday during which you can lie in hammock beneath the palm trees, swim in crystal clear waters and scuba dive in coral-filled waters, the Maldives is the perfect destination. Many families visit this spot using Away Holidays services each year, as there are plenty of child-friendly activities, along with shallow lagoons which make for safer swimming. Whilst companies like Away Holidays aim to make their holidays as inexpensive as possible, the Maldives location – to the south west of India – means that the flights tend to be more costly than a European destination. As such, in order to make the trip worthwhile, it’s best to stay for a minimum of a week, if not two. With more than one thousand islets and twenty six atolls, there’s certainly no shortage of choice when it comes to places to stay. 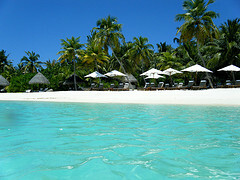 However, most visitors prefer to stay on one of the larger, more populated islands, like Malé, the Maldives’ capital. This is a great place for those who want an authentic Maldives experience, as the shops here are not tourist-orientated, and there are plenty of local residents bustling around the colourful streets and marketplaces. Malé also serves as the Maldives cultural hub – here you’ll find the National Museum (which is brimming over with Royal Family artefacts), as well as the Mulee-Aage Palace (this was the first residence for Sultans) and the Tomb of Medhu Ziyaaraiy. However, there are of course, plenty of other islands where you can stay; if you’re in search of excellent restaurants and a more resort-like atmosphere, try Kuramathi Island. If you’d rather experience a Robinson Crusoe type of holiday, look for accommodation in Madiyaru Island – this is especially popular with clients of Away Holidays who enjoy scuba diving, as the waters here are filled with exotic fish and beautiful coral. Bandos Island is considered by many to be one of the most child-friendly, and is home to some fabulous beaches, whilst Cocoa Island offers world class snorkelling and spas. One of the most peaceful and calm places in the Maldives is Nika Island, which has less than a dozen holiday apartments, each of which has its own private beach. For those who wish to explore a tropical jungle and enjoy some amazing off-shore diving, Veligandu is recommended, whilst those who wish to swim in emerald lagoons filled with colourful coral should head to Mushimas Mighili. Given the copious availability of luxury resorts, many of which span the complete islands, there’s certainly no shortage of choice when it comes to places to stay. Most visitors prefer to stay on one of the larger, islands that are less crowded and have numerous secluded bays and coves to leisurely spend the sunny days while immersing in an authentic Maldives experience. Malé, the capital of Maldives is a good choice for those seeking relatively affordable accommodation vis-à-vis the luxurious island resorts. This entry was posted in Away Holidays, Bandos Island, Holiday, Holiday activities, Holiday destination, Maldives, Nika Island, Vacation and tagged Away Holidays, Bandos Island, Holiday, Holiday activities, Holiday destination, Maldives, Nika Island, Vacation on February 21, 2013 by admin.